The Washington Institute has issued a report saying that a disastrous war between Israel and her neighbors may be looming on the horizon. If hostilities do in fact break out, the “fighting could take on a regional dimension not seen since 1973,” said David Schenker, a senior fellow and director of the Arab Politics Program for Near East Policy. “If you [ Israel ] bomb Rafik Hariri International Airport in Beirut, we will bomb Ben-Gurion Airport in Tel Aviv. If you bomb our docks, we will bomb your docks. If you bomb our oil refineries, we will bomb your oil refineries. If you bomb our factories, we will bomb your factories. And if you bomb our power plants, we will bomb your power plants,” Nasrallah declared. Syria's new level of boldness is the key reason for the prediction of war. Syria has transferred shoulder-fired ordnance to Hizbullah, which has previously been marked by Israeli officials as a “red line” issue. It has openly expressed its support of terrorist organizations. There are now reports that the Syrians have delivered Scud missile to its allies in Lebanon. If the guerrilla forces were to obtain Scud missiles, they would pose a huge danger to Israel. A Scud missile was originally designed to carry a 2,000-pound conventional warhead, with ranges from 100 to 180 miles. During the second Lebanon war, most of the rockets fired at Israel only had payloads of a few pounds, and they could only reach about a dozen miles into the nation. 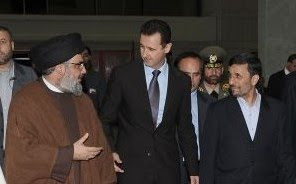 The leadership in Damascus is obviously trying to see what it can get away with in Lebanon. At some point, they are going to miscalculate and Syria it will find itself in direct conflict with Israel. "The risk of miscalculation that could result from this type of escalation should make Syria reverse the ill-conceived policy it has pursued in providing arms to Hizbullah," it said. "Additionally, the heightened tension and increased potential for conflict this policy produces is an impediment to ongoing efforts to achieve a comprehensive peace in the Middle East." The IDF recently came very close to attacking a convoy carrying weapons from Syria to Lebanon, but at the last moment decided against it, according to the Wall Street Journal. Israel has already proven how far it is willing to go to preserve its strategic interests. When it bombed a Syrian nuclear plant in September of 2007, the raid could have easily triggered all-out war between the two nations. Israeli Prime Minister Binyamin Netanyahu faces danger on so many fronts, he must have the hardest job on the planet. Last week, he sounded an urgent alarm regarding the Iranian nuclear threat. Netanyahu told ABC News that “we have a lot less time with each day that passes.” He called for the international community to deliver “crippling sanctions” against Iran. So far, the global community has been unwilling to apply proper pressure on the Islamic state. I don't see any willpower on the part of the UN and the Obama administration. We already have a police effort in Southern Lebanon. Their mission was to prevent Hizbullah from rearming. They failed so miserably in their task, I can only conclude that they are on the side of the terrorists. President Obama has talked about the desire for peace, but he's yet to draw a line in the sand on what must happen. He has proven himself unwilling to upset his Arab brethren. I think what is holding war back is the fact that the Middle East has become so dangerous. Israel is unwilling to provoke an enemy that is armed to the teeth. The Arabs are so busy building up their network of missiles, they don't have time to attack the Jewish state. We don't need the Washington Institute to know that war is coming to the Middle East. The Bible predicts that there will be several conflicts in the coming days. I keep seeing on the news Middle East correspondents reporting from the city of Damascus. If they knew anything about Bible prophecy and how closely our day matters to the prophetic Word, they might decide to file their reports from some other city. “The burden of Damascus. Behold, Damascus is taken away from being a city, and it shall be a ruinous heap” (Isa. 17:1).